New data reveals that 8,819 units were commenced in 2014, up from 4,708 in 2013 (+87% yoy). 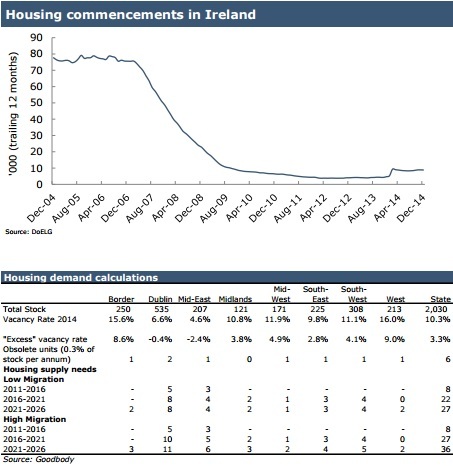 According to Dermot O’Leary, chief economist at Goodbody: “This may appear to suggest that housing construction is now growing rapidly, but the growth achieved must be put in the context of the falls seen over previous years. “As the above chart shows, housing commencements peaked in 2005 at 77,709, so were still down 89% from peak levels despite a near doubling last year. Almost half of the commencements last year were in February. This was due to the rush to start projects ahead of the introduction of stricter and more expensive building regulations in March 2015. “Regionally, the biggest increases occurred in the commuter counties to Dublin – Kildare (+223%), Meath (+224%) and Wicklow (+355%). Dublin (+108%) also saw strong growth. The Greater Dublin Area (GDA) overall saw commencements increase by 143% in 2014. Outside of the GDA, commencements grew by only 16%. Regional differences are key in the Irish property market. Andrew Nugent, the incoming president of the Society of Chartered Surveyors Ireland (SCSI), said: “The official housing completion figures show that 11,016 units were completed in 2014. However, the commencement figures are far lower and this suggests to us that the actual level of housebuilding is actually lower than the completions figures suggest. This is due to the fact that the completions figures are based on the number of units connected for electricity.